Better late than never they say, so here goes – Happy New Year! – wishing you all things you would wish for yourself, hoping you stay happy and healthy and loved. It is very rare for children to go far from their neighbourhood either. In school they learn by wrote all the districts and regions, the levels of authority etc but most know very little about their country. 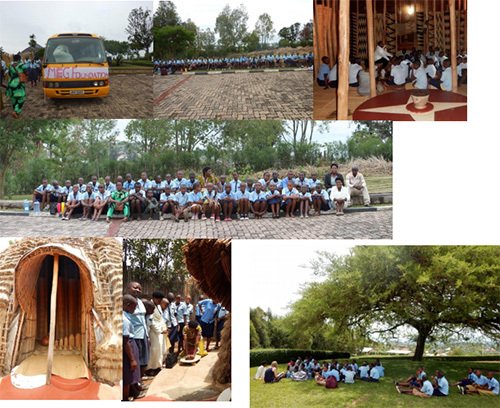 Imagine their excitement then when we arranged a trip at the end of the school year to to the King’s Palace at Nyanza. I have wanted to arrange this for a while and I am very grateful to Würde für Kinder for helping out with the cost of the Nyanza visit. Click here for their website…orhere for their Facebook page. The King’s Palace is a favourite with me, I have visited many times and often take visitors there. There is a replica of the old palace in the ground a wonderful structure using natural materials in intricate and beautiful designs, along with traditional baskets and furnishings. Sadly for me I was back in the UK when the Primary 5 and Primary 6 children went on their first adventure. I am grateful to Wilma for helping out with the organisation of the trip and for the photographs. Travelling in style, making sure everyone knows who we are! (Important for the police checks along the road apparently) arriving and learning about an important part of Rwandan history. The roof of the palace was being repaired, a great opportunity to see skilled crafts people at work. There is also the ‘new’ palace to explore and a compound where the royal cows are kept. No photographs are allowed inside the palace. The wife of the king was murdered during the genocide and is buried in the grounds. Recently the man who claimed to be the last remaining King died in poverty in the USA. His body was brought to Rwanda and his remains were interred in the grounds. Cows are a very important part of Rwandan culture. The children know of its importance and our dance troupe dances a ‘cow’ dance, often performed at weddings. This was a perfect opportunity to see how the royal family valued the cow and how they formed part of major ceremonies – there are many stories and traditions around this subject. A short distance away is another palace, a more grand structure which was never occupied by the royal family. It is now the National Art Gallery. Art is something which is developing in Rwanda, art lessons, when they occur are often sessions where the teachers draw something on the board – I have seen a flower once, another time a goat – the children try to copy it, if they have a notebook with plain paper. If they have aces to colours they can colour the drawing too. This was a good opportunity to see something a little different. Finally some more photographs of the craft work, which is distinctive and so very beautiful in my view.